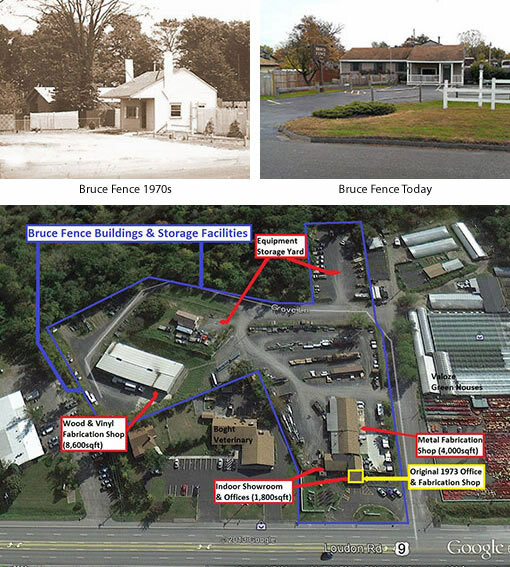 Bruce Fence has been in business for over 40 years providing quality workmanship and value to residential and commercial clients alike. Based in Troy, NY, Mark and Mary Bruce started out small in 1970 as a sub-contractor for chain link fence sold by Montgomery Ward. Soon after we added Sears and overflow work from 2 other fence companies in the area. Our business steadily grew with more and more requests to purchase directly from us and in 1973 we moved our business from Troy to a 400 sq. ft building on Route 9 in Latham. The original 20′ x 20′ building serves as part of our storefront today. Today our outdoor display area, indoor showroom, offices, metal, wood and PVC fabricating buildings occupy more than 14,400 sq. ft on 4 acres of land. We not only work in, we reside in and are raising our families in the Capital District. All shop and field crews are personally supervised by our son Mark. Several have been with us starting right out of high school and we have watched them mature into talented trades people as well as responsible members of the community. When you phone our office, the voice on the other end is one of our sales or office associates, not an auto-attendant. All sales and office associates are highly experienced, some meeting our customers’ needs for over 20 years. We are a family business that emphasizes value and treats our customers like family. To our existing customers, thank you for being a local hero and supporting a small family business; to our new customers, welcome to the Bruce Fence Family. Copyright © 2018 Bruce Fence. All Rights Reserved.